Terrain table without breaking the budget. #1 You need a full 4 x 8" piece of blue board or pink board in a thickness of 1 1/2 or greater. Typically these cost around $18+ dollars and can be bought at a construction supply store. Or if you or someone you know is in the contruction trade you can get it for FREE. 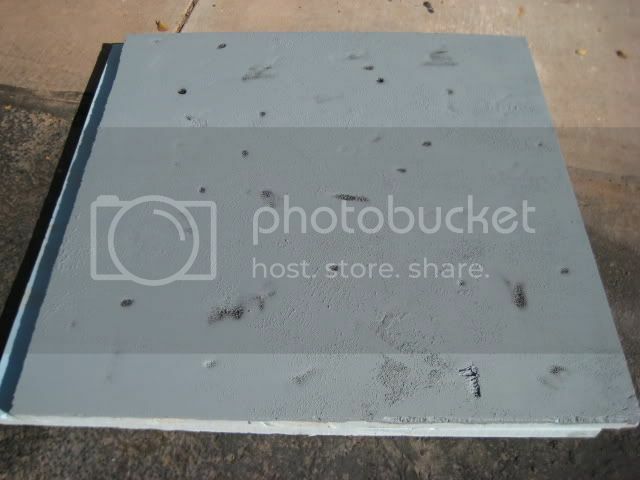 Just ask them to ask the roofers when they show up if they can have a piece. Typically roofers will bring an excess along because they often have to cut odd shapes to fit certain parts of the roof. They usually don't mind parting with a piece or two. Remember, they're a pain to pack around so make sure the person you ask knows they can cut it right in half if need be. 2. One pint of paint goes a real long way for the table. I've done two of these table, both 4' x 8' and I've used one whole pint. Typically the paint goes for $6 to $10 a pint. Always check you local Home Depot or Lowes for thier sale paint. You can find great deals on left over paints. Use an interior latex paint in a matte finish. The great thing about using house paint is you don't need a clear coat over it to protect the paint. It's very, very durable. 3. Spray Paint. $1 Here the quality of the paint really doesn't matter, so the cheaper the better! Just pick a color that will work well under your primary paint. 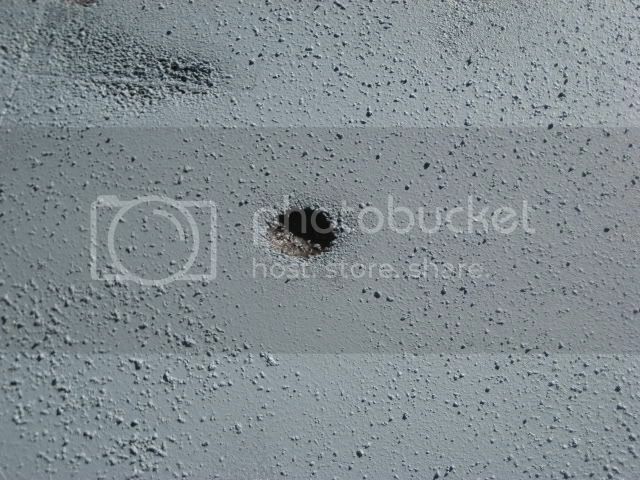 4.Paint Texturing: Sand . I bought this awhile ago and Can't remember how much I paid for it. I think it was around $10. Kinda expensive but it goes a LONG way and I was in the paint isle, voila there it was. Ive used half the bag so far for 8' x 16' of table. Also any texturing will do so if you can get real sand for free it will do the same thing. 5. Tools and supplies. This is where the dollar store rocks. 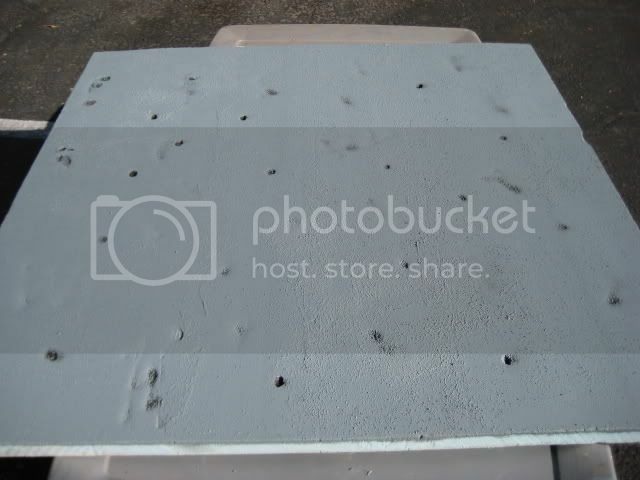 You need a roller, preferably 9", a 9" 3/8 knap paint roll, a $.79 paint tray insert (you can get away with just using this and not buying a paint tray as well. I had to but a plastic trowel and some Putty because of the lines in the board but you can get board thats perfectly flat. Lets say about another $5-6 Dollars if your dollar store has these items. 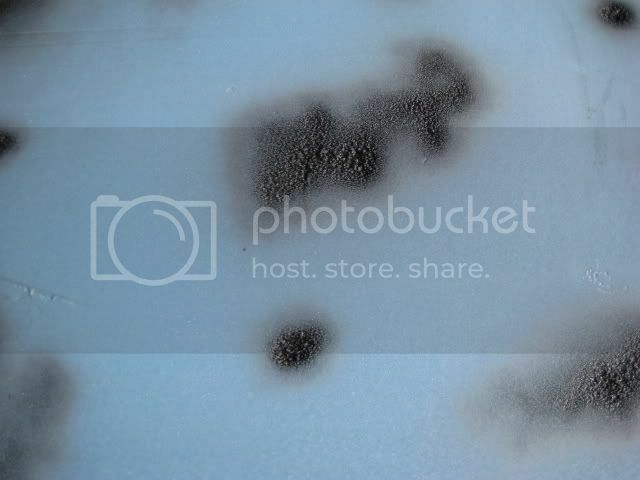 I washed by blue board with soap and water because it did come off a job site and was very dirty. Blue board drys very quickly if you wipe it down, it will not absorb water. 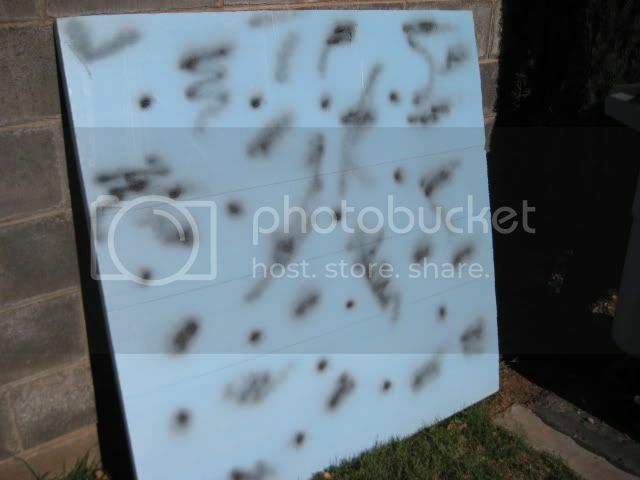 Next I hit the boards at random with the spray paint. 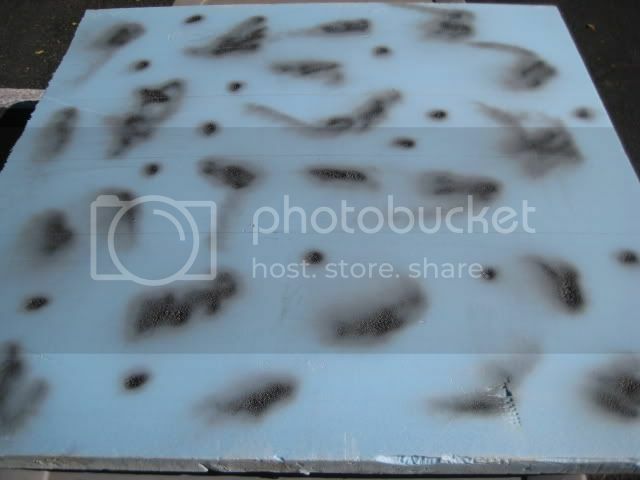 Spray paint will disolve the blue board allowing you to make really cool looking texturing and craters. The one thing I should have remember to do was be a little more agressive with the spray paint because the roller will cover up the shallower impressions. Don't go easy on the sand. Dump some in, mix it up, look at it, and keep going. You want it sandy but still liquid enough to roll on. 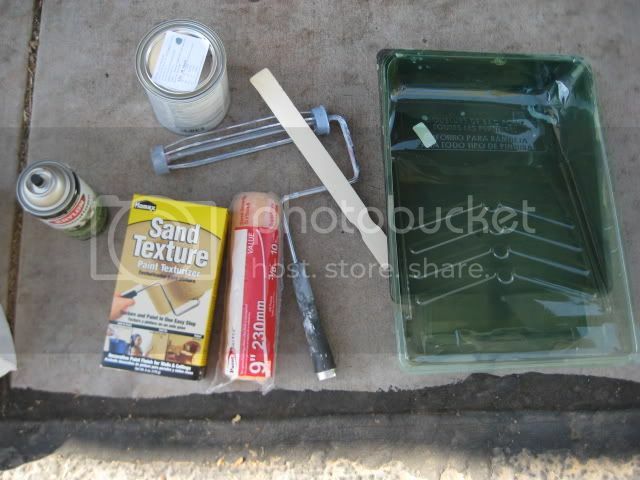 You can go lighter on the sand in the can to play it safe and mix more in the paint tray. Even a little too thick you can push around the sand to even it out and make some nice raised areas. Get nuts with the roller, make sure you roll at every angle to make it look more natural and cover up the board competely. Also after I did the top of the board, I rolled the edges so when the table halves are put together it will help conceal the board edge and look nicer. Step three: Let dry and finish! After it dries if you feel so inclined later on you can dry brush black around the blast craters to add a more scorched look. Also as I'm waiting for the paint to dry, I'm devising a way to connect the two boards while in use. I'll either sink some drywall anchors in the sides and make a strap to bolt them together or something like that. you could even use magnets and metal strapping, but I reccomend you fasten then together. If you have the room to store it, you can duct tape the back side and fold the table in half quickly and easily. Duct tape holds up remarkably well and keeps the table together.